W4CKH was first licensed in 1982 as a Novice operator with callsign KA4ZLD in High Point, N.C. I could not afford any HF equipment at the time being a freshman in high school, I had saved up only $75. Prior to this time, I had constructed wire dipoles for shortwave listening and then was fortunate to meet KA4NHD and K4AME who offered morse code classes weekly. After studying for the novice exam and memorizing morse code, I took my exam at a National Guard facility and the test was administered by an FCC official. Soon thereafter my mother offered to help buy the radio which was a Tempo One (aka Yaesu FT200). So much excitement was in the air the day I went to purchase the Tempo One. That same day, I measured out a 130 foot length of 12 AWG wire, cut it in the center and attached coax to it. I brought the radio home and used a J38 straight key to tap out my first contact which was on 80 m band to a station in West Virginia. Picture below is the Novice Station which shows the Temp One and several other analog devices. 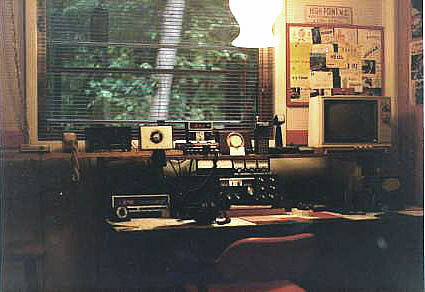 W4CKH now serves as President of the High Point Amateur Radio Club (see www.w4ua.org).